Spring training is almost over. It is time to take a good look at the division. With few big name free agents left, it looks like the teams are set. 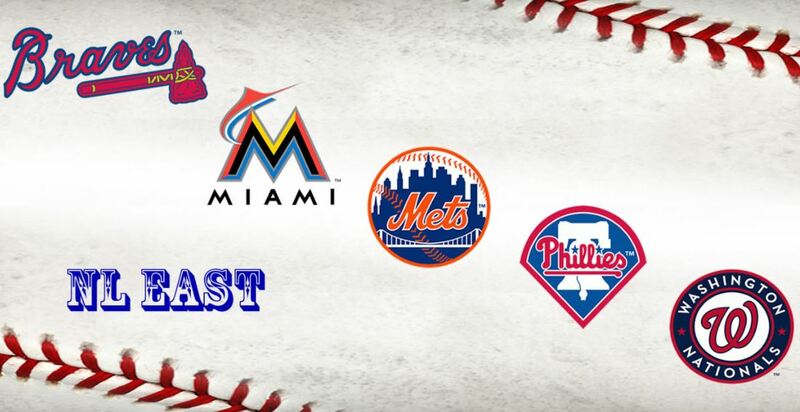 The Mets will play just under half of all games against NL East rivals. The strength of these teams will determine our fate this season. Here is some analysis on each team going into Opening Day. Goal for 2018: This one is simple. Cruise to another division title and get to the World Series. With Harper, Murphy, Gio all on their last year before free agency the Nats understand that this is a do or die season. Zimmerman, Scherzer and Albers all had great seasons in 2017 but are not getting any younger. If Washington plans on raising a pennant, new skipper Dave Martinez needs to make sure the team plays to potential and avoid a postseason choke. With Dave Martinez leading the team, Washington hopes to finally win a postseason series. Strengths: The Nationals simply have lots of good players. They have a nice mix of veterans, youngsters and stars. There are not many holes on this team. The fact that the rest of the division is relatively weak should mean that they will cruise to another division title. Weaknesses: Hard to find. They have a good lineup, rotation and bullpen. Matt Wieters did not have a good 2017 and has been declining for a few years. In addition, they could suffer from complacency. This team is banking on using the same formula that led them to success in 2016 and 2017. That could come back to bite them. Realistic Predictions: If anyone predicts that the Nats aren’t going to win the division at this point, they are going to have a lot of explaining to do. While surprises happen every year, it seems that no other division rival is ready to compete. Predicting the postseason in March is practically impossible, but picking the Nats to win a pennant is a respectable choice. With Murphy and Harper both entering their last seasons before free agency, could this be the last chance for the Nats? Goal for 2018: After 3 years of 90+ loss seasons, the rebuilding Braves need to finally get to .500 and be in the wild card chase. However, the Coppolella scandal really hurt what was once the best farm system in the game. This will not be so easy to recover from. They have some nice pieces big league pieces like Freeman, Inciarte and Flowers. If Swanson can bounce back and Vizcaino become the closer of the future, this team will turn some heads. Atlanta lost 12 prospects thanks to a scandal led by John Coppolella. Strengths: Jose Ramirez, Sam Freeman and Arodys Vizcaino all had strong seasons in 2017 out of the pen. If the Braves could give these guys a lead, they will be in good shape. Weaknesses: The rotation was simply bad in 2017. Dickey was the best of the worst and he is a free agent. Neither Kazmir nor McCarthy are likely going to save the rotation. If Teheran doesn’t return to all-star form, Atlanta will be in for many long nights. Teheran is the big x-factor for the Braves rotation. Realistic Predictions: With the harsh punishment they suffered in November, Atlanta is in bad shape long term. The stars they hoped would be here soon are no longer in the organization. They still have some good pieces but a lot needs to go right for them to be real contenders. Goal for 2018: The rebuild from within failed. Last year was the year that Phillies fans hoped would be the turning of the corner. 96 losses later they have many disappointed fans. Therefore, the Phillies decided to just sign big names. Jake Arrieta, Carlos Santana, Tommy Hunter and Pat Neshek were all signed to multiyear deals. By signing two guys who turned down qualifying offers (Arrieta and Santana) the Phillies sent a message that rebuilding from within failed. Their goal is simple to be relevant now. Will Carlos Santana provide the power that Ryan Howard once did? Strengths: They have a respectable bullpen thanks to Hunter, Neris, Garcia and Neshek. Santana is a winner. Hernandez and Altherr each improved last year. With a bit of luck they will be a much improved team. Weaknesses: Rupp, Franco and Herrera all took steps backwards in 2017. The Phillies are relying on youngsters J.P. Crawford, Rhys Hoskins and Jorge Alfaro to step up if they want to put up any offensive numbers this season. That is a lot to ask. For Philly to win, Franco and Herrera must put it together. Realistic Predictions: This can go in many directions. Philadelphia clearly has a lot of solid young players ready to make an impact. Sadly for them, this is not new. Arrieta is a good pitcher but his numbers have noticeably declined since his CY Young season in 2015. Look for the Phillies to get out of the 90 loss zone but a lot needs to go right for them to actually be .500 this year. Goal for 2018: Someone will one day write a book on these Marlins. It will either be about a team that was an unmitigated disaster or one that shocked the world. Most likely the former. The new ownership group with Captain Jeter at the helm spent this offseason dumping all good hitters. Stanton, Gordon, Yelich and Ozuna are all gone. Their only goal for this season is not to embarrass themselves too much. This season will likely go down as the start of a rebuilding process. Derek Jeter- The most hated man in Miami. Strengths: Their catching and infield is actually not that bad. Realmuto looks like he could have a breakout season behind the dish. On the infield Bour, Rojas and Castro are all guys who can hit for high average. They have some potentially decent relief pitchers who could make them tough in later innings but overall, strengths are hard to find here. Weaknesses: To put is simply, they are expected to lose a lot. If they couldn’t get over .500 with a far better offense, it is hard to see them improving with guys no one has ever heard of. Probably their biggest weakness is the fact that guys don’t want to be in Miami. Castro made that crystal clear after his trade. Realistic Predictions: 100 losses. If they are lucky they may only be in the 90 loss range. If they are competitive around the all-star break that would be a huge surprise. The once dominant outfield is gone. The Mets are lucky to be in a division with many flawed teams. This means that we could see them in contention simply due to the fact that they have a weak schedule. If the Nats don’t get off to a good start, the Mets will have a chance to make a serious move. Never underestimate anyone but it is safe to assume that most experts will be picking the Nationals to run away with this division and the Mets coming in second.